January 27, 1938: This ad promoting the release of Everybody Sing ran in the “Film Daily” trade paper. January 27, 1940: Judy attended the premiere of The Grapes of Wrath seen here with Helen Parris and Forrest Tucker. January 27, 1942: Judy and husband David Rose, along with Judy’s mom, Ethel, and Baron Poland, arrived at Camp Robinson, Arkansas (outside of Little Rock) for the next leg of their USO Tour, which was a two-night engagement. 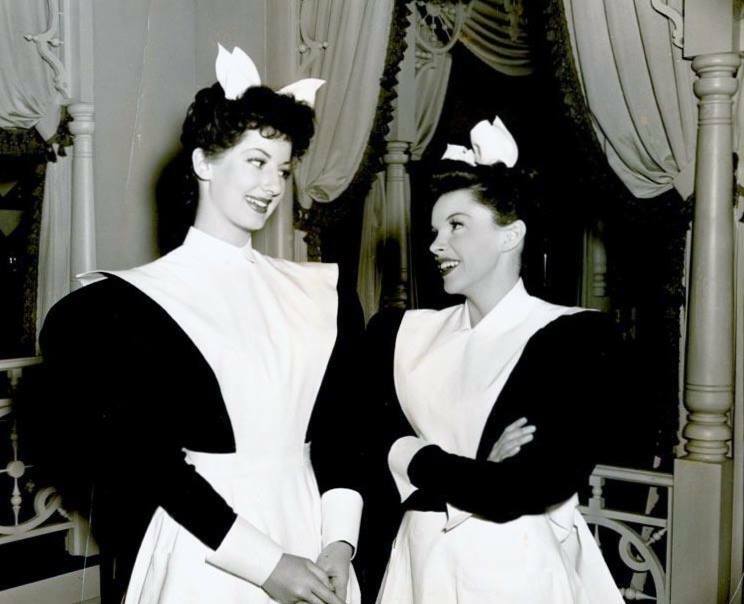 Photo: Promotional photo of Judy in “uniform” for For Me And My Gal. January 27, 1944: Filming continued on Meet Me In St. Louis on the “Interior Ballroom” set. Time called: 10 a.m.; Judy arrived on stage at 10:24 a.m.; dismissed: 6 p.m.
Also on this day, Decca Records released single #18584. 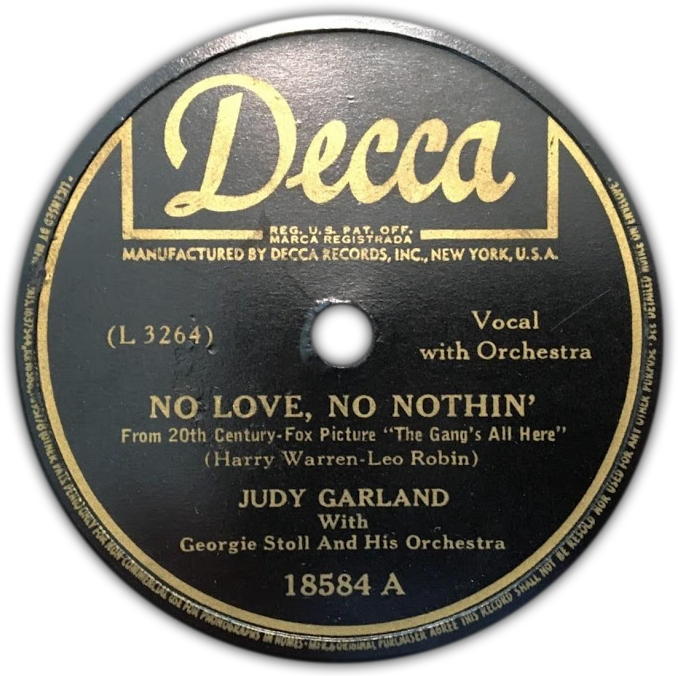 On the “A” side was Judy’s “No Love, No Nothin'” and on the “B” side was “A Journey To A Star.” Judy recorded the songs on December 22, 1943. Labels from the Rick Smith Collection. Thanks, Rick! 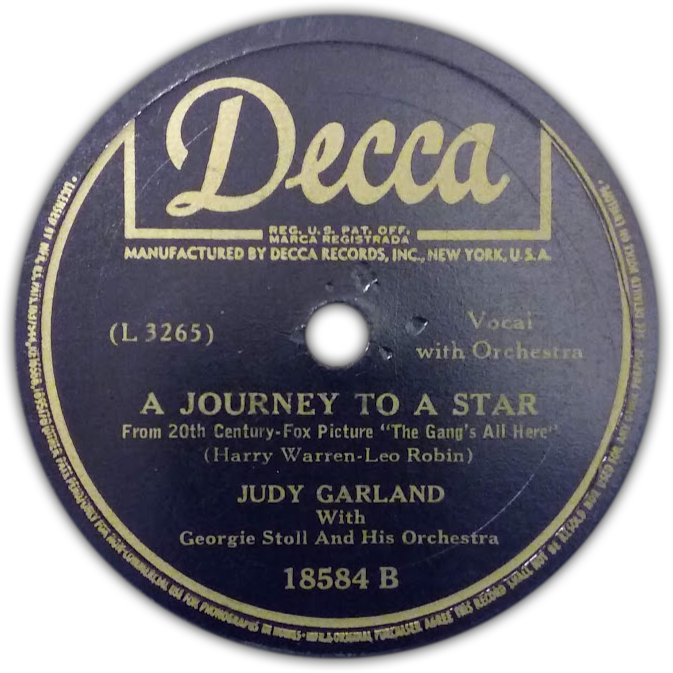 Check out The Judy Garland Online Discography’s Decca Records Section for details about all of Judy’s Decca recordings and subsequent re-releases. January 27, 1945: Filming on The Harvey Girls continued with scenes shot on the “Interior Harvey House” set, specifically the “Training Montage” number (“The train must be fed!”). Time called: 10 a.m.; Judy arrived at 10:40 a.m.; dismissed: 2:45 p.m. A rare short day for Judy! January 27, 1948: Women’s Weekly magazine printed this full-page Max Factor ad, promoting the release of Easter Parade (along with their makeup line, of course). Note that they used the Till The Clouds Roll By promotional photo from three years earlier. 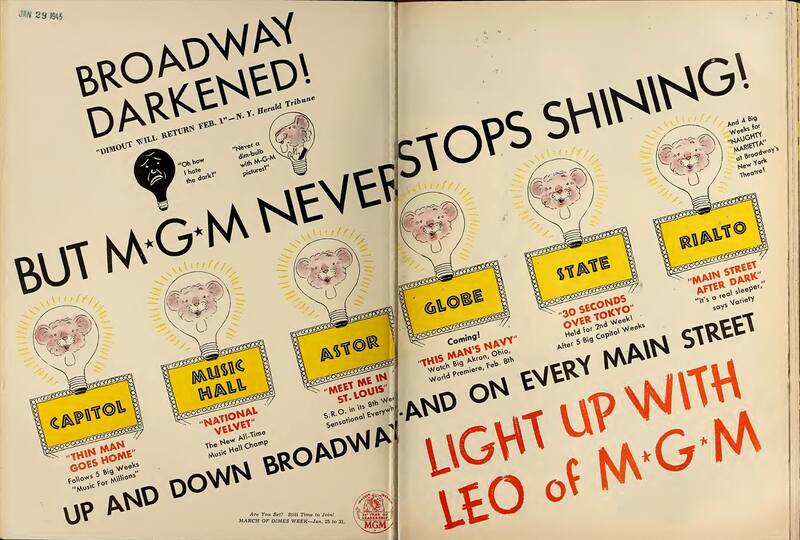 On this day at MGM, filming on Easter Parade continued with scenes shot on the “Exterior Michael’s,” “Exterior 5th Avenue,” and “Interior Vaudeville Theater” sets. Judy was in makeup at 7:00 a.m.; she arrived on the set at 9:00 a.m.; dismissed: 5:30 p.m.
January 27, 1949: Judy completed filming In The Good Old Summertime, finishing the film in only forty-five shooting days. 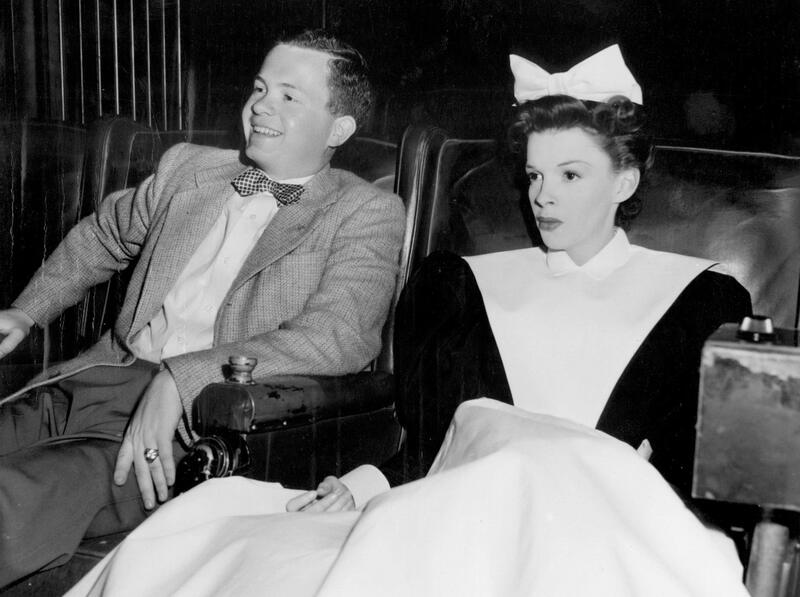 Judy had been absent from the set for sixteen days due to illness, but the production finished filming five days early. Total cost of the film: $1,576,635 ($12,800 over budget). It grossed over $3,400,000 on its release in August of 1949. 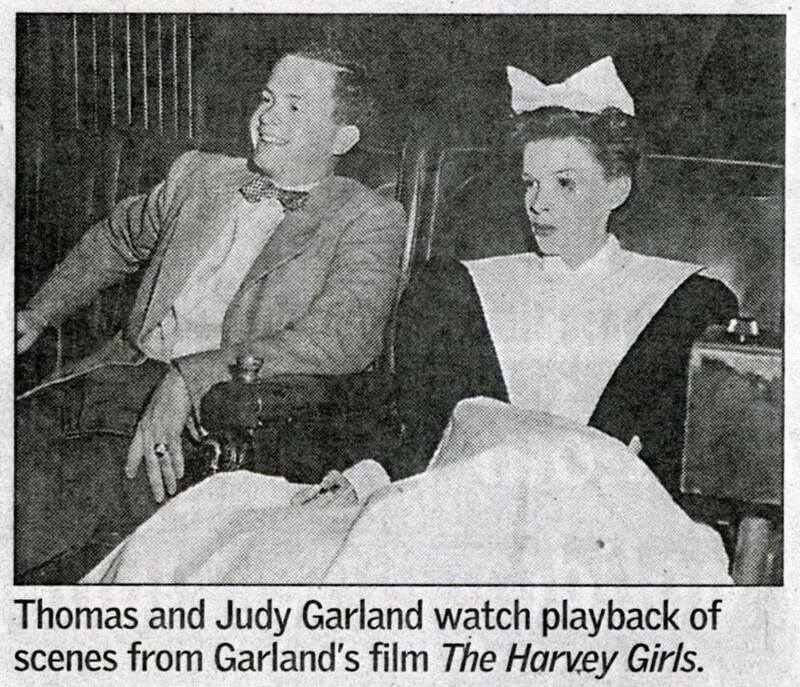 January 27, 1954: Columnist Louella Parsons reported on a recent party (exact date unknown) at which Judy sang. 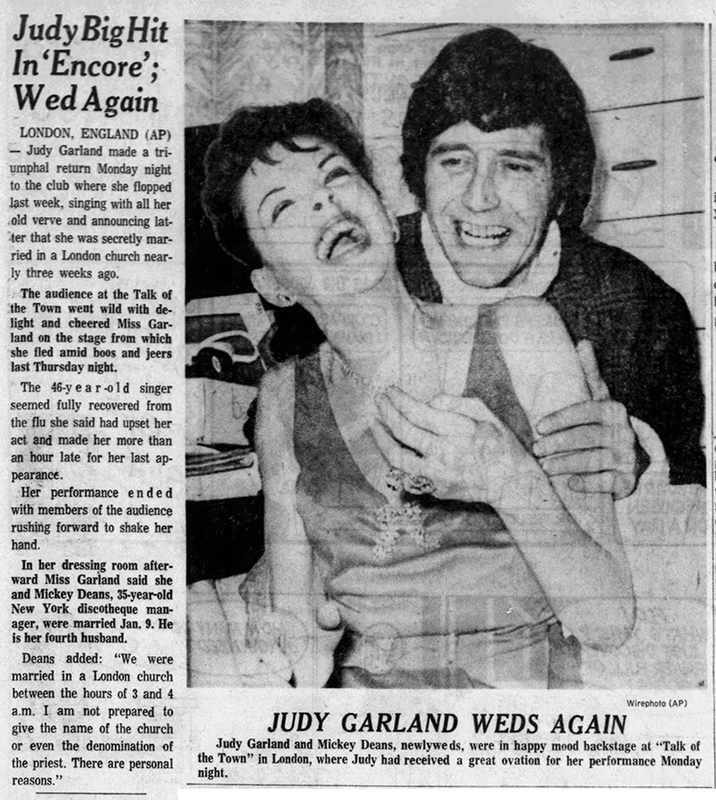 The stories about Judy singing her heart out half or all the night at Hollywood parties are legendary. People spoke in awe at how easily she shared her gifts, which is a testament to, and great examples of, Judy’s love of performing. To this day, no known recording of Judy singing at any of these parties is known to exist. Maybe someday one will pop up! 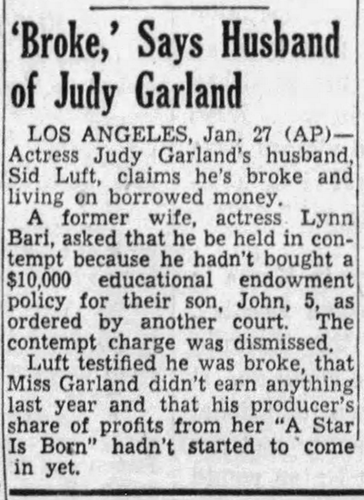 January 27, 1955: Sid Luft’s (Judy’s husband) legal battles with his ex-wife, actress Lynn Bari, continued. This time, Luft told the court that he did not have any money even if he was Judy Garland’s husband. According to Luft, Judy didn’t make any money the previous year and the money from producing A Star Is Born hadn’t come in yet. January 27, 1964: The big entertainment news of the day or rather, week, was the recent announcement that “The Judy Garland Show” was being canceled. The show was a critical success and was not a ratings disaster as some might have assumed. The columnists and reporters were obviously well aware of the fact that CBS messed up, not Judy. 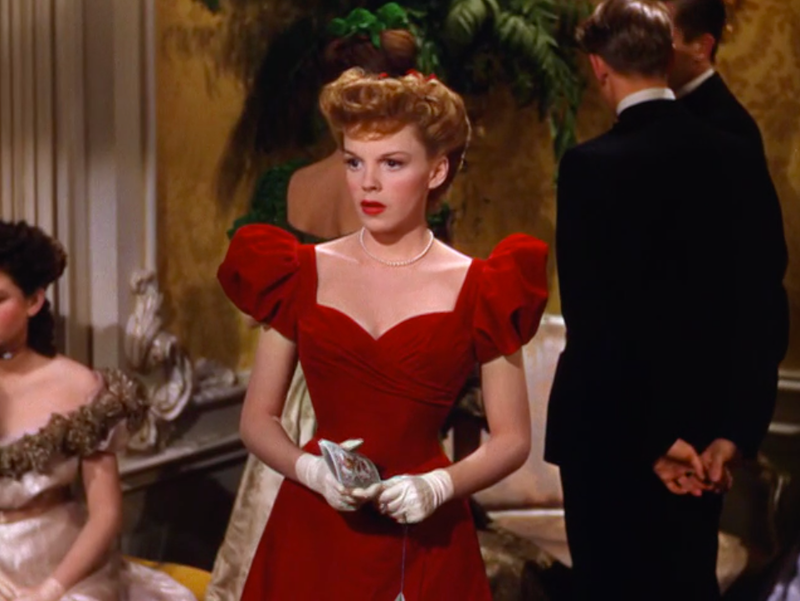 New York, Jan. 27 – Poor Judy Garland! 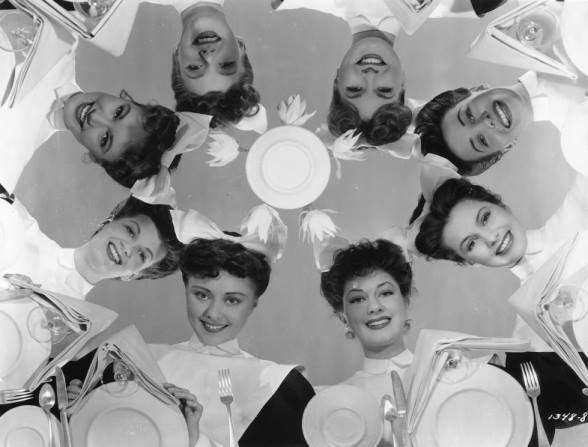 After triumphing over the bureaucratic idiocy that sought to remake her personality in the image of Kathryn Murray (ever so hostess, with a foot in every act) now faces a springtime cancellation. It hardly seems fair. The gallantry of CBS in permitting Miss Garland to resign, to announce that she is quitting television to spend more time with her children, deceived no one. In truth, Miss Garland ratings weren’t awfully low, especially if you count in millions rather than Nielsen points. But the opposition – that ugly, violent, always-vulgar, ever-predictable Bonanza = continued to delight the masses. It’s an older show, with “viewer habit” well established. The falling off of Miss Garland’s public in the first weeks of the show is understandable. The star was nervous, sometimes to the verge of collapse. One felt so keenly on her behalf that it sometimes seem kinder to turn off the set, as it often seems kinder to leave the room when a visitor astounds us by bursting into tears. While Bonanza had the rating, it has never had the publicity, the rumor, speculation and raging public debates that Miss Garland’s show has provoked. Even a sone read every day in the gossip columns that CBS despaired of ever building a rating with poor Judy, she continued to be reigning favorites so far as conversation went. People may not have watched her but they certainly were curious about her. Well, one thing that may bother her is that everybody wants to know every last detail of her sad childhood, her marital problems, her ill health and her financial status. Miss Garland has something of the appeal of doomed queens. I fancy we all find greater delight in reading about the mad loves of Mary of Scots or the dazzling extravagances of Marie Antoinette than about Queen Victoria, who sat on her throne, fat, dull and Pius, for 60 years. Watching the Judy Garland show last night, I was struck by its enormous improvement, as a show. And by the good hour, the sly comic gifts of the star. Granted, there are still moments when one sees the canker in the rose, the snail under the leaf. But how nice it would be if CBS would find another time spot for Judy – opposite nothing of such broad vulgar appear as Bonanza – and brought her back next season. Will Surgery Save Judy’s Ailing Show? HOLLYWOOD (AP) – What’s the outlook for the Judy Garland show, televisions most troubled hour? Recently a CBS executive said the Sunday night songfest stood a good chance of returning next season. Garland fans, who rank only to Elvis Presley’s in vehemence, have been bombarding the network with save-Judy please. EXCEPT FOR HIS age, (just turned 29), Smith could be termed the grand old man of the Judy Garland Show. He was in it from the start, first as designer and then as producer. Hank has seen a platoon of directors, writers and executive producers march through the halls of television city. Not since the quiz scandals has a television show been fixed so often. Van Dyke and the backstage bit were dropped. Judy’s finale with the theater trunk has been retained. The show will be featuring another gimmick which might become a fixture: Ken Murray and his home movies of Hollywood stars. SOME WRITERS have been intimating that Judy has been up to her old habits in being late, etc. 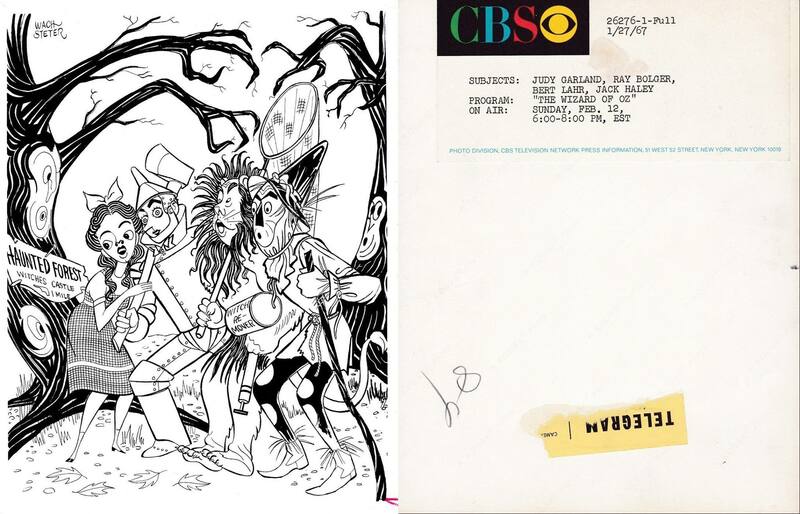 January 27, 1967: CBS-TV sent out this wonderful Ozzy artwork for newspapers to promote the upcoming telecast of The Wizard of Oz on February 12, 1967. 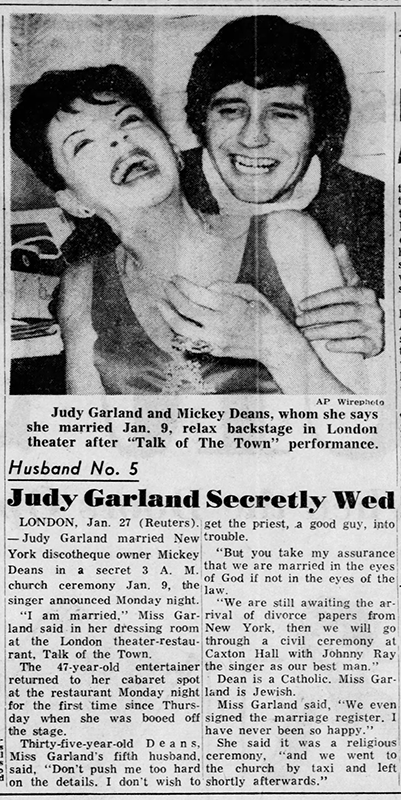 January 27, 1969: Judy started her final week at the “Talk of the Town” nightclub in London, England. The big news (which made the papers the next day) was that backstage at the club (see photo above) Judy and Mickey Deans announced that they had been secretly married on January 9th. Judy said, “It was a religious ceremony and we went to the church by taxi and left shortly afterwards. It was a proper thing and the priest was somebody I’ve known for a long time.” She also said, “We even signed the marriage register. I have never been so happy.” Judy was still legally married to Mark Herron. Their divorce wasn’t final until February 11, 1969. 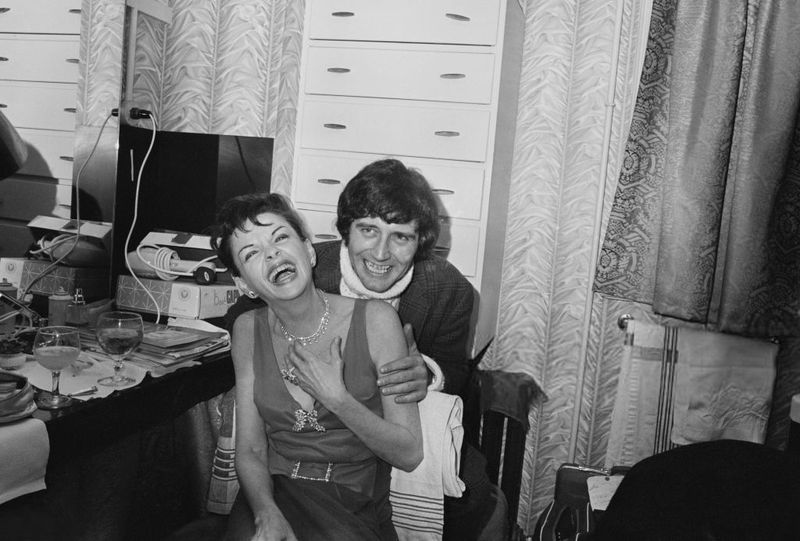 On March 15, 1969, Judy and Deans were legally married at the Chelsea Registry Office in London, England. Back to January 27th, on this night John Meyer rented a portable Nagra reel tape recorder (which used five-inch reels and a multi-directional Sehheiser microphone) and recorded Judy’s performance. Later, Judy, Deans, and Meyer were up at the Ritz Hotel listening to the tape until 4 in the morning. Judy and Deans agreed to pay the $10 a day rental fee to keep the machine in order to get more performances on tape. 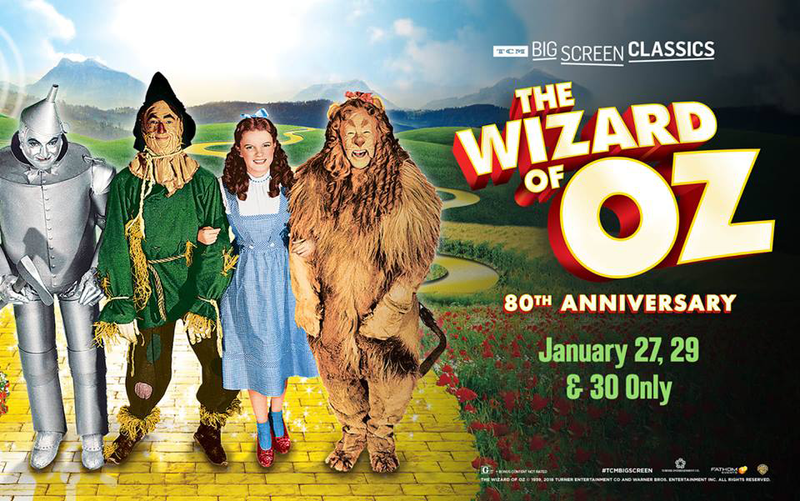 January 27, 2019: Turner Classic Movies via Fathom Events rereleased The Wizard of Oz in theaters for three days/nights only, including January 29th & 30th. 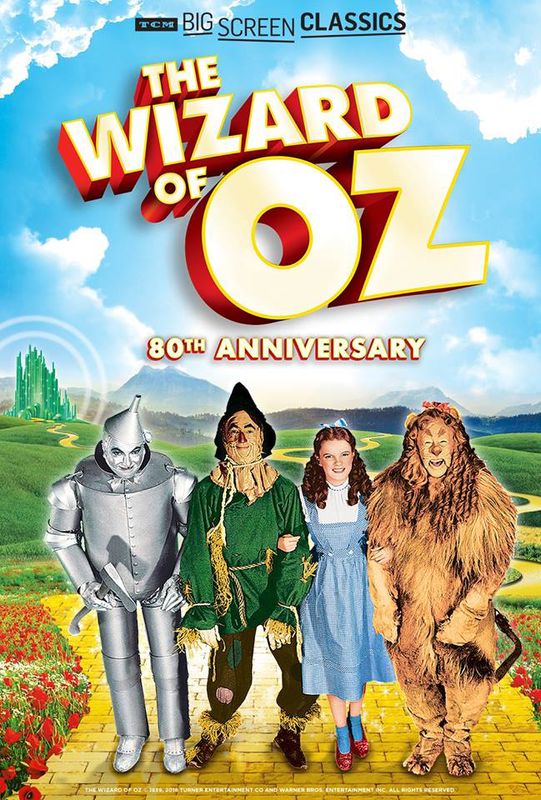 The rerelease was part of the celebrations of the film’s 80th-anniversary.